I narrow my vision, and broaden it at places, and conclude collectively, however big or small dreams be, we run after it physically or mentally. It accounts for the efforts that are laid, and its efficiency, which ultimately makes you the achiever or let you stay a dreamer in turmoils. At this juncture I wonder, what about those dreams, that can turn into reality with efforts of letting no stones unturned, but it gets targeted by some who bear an objective to demolish the success that might result of those efforts. I dream, they dream too. Is it the clash of dreams? Or is it the clash of wants? Is there a midway between Dreams and Wants which separate them as the two different entities? I suggest to myself, let dream be something sacred, something that emanates a positive aura. And Want be something which other than superimposing dreams also fathoms further to cover sick, wicked and wrong desires. Let Dreams be firmly stalled on the godly pillars of morality and wisdom. And let Wants hung across the supports from knowledge and individualistic approach to worldly matters. Unlike reality, if Dream-Catchers existed, they could steal wicked and unhealthy wants from dreams, and the leftover would be pure in every heart. 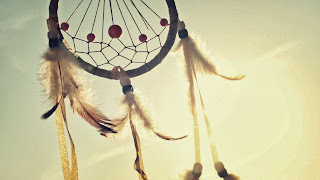 Dream-Catchers would have assisted me, whoever tried to mess with my dreams. I love my dreams, for they are the reason to bring smile on my face. They hint of the possibility that can come true. They hint me of those wounds that will be healed and showered with love life would be. Will be free from wants sicker, if Dream-Catchers could play.